Although it’s more faithful to the characters of The Jungle Book than any of the Disney adaptations, Andy Serkis’ long-delayed Mowgli: Legend Of The Jungle owes as much to bastardized interpretations of Joseph Campbell as it does to the stories of Rudyard Kipling. Mowgli, the wild child raised by wolves in central India, has become a boy hero with a destiny to save the jungle from “chaos and darkness.” His banishment to the human village at the end of Kipling’s first Mowgli story, “Mowgli’s Brothers,” is now but a step on a circular, monomythic journey to defeat his nemesis, Shere Khan. When the first trailer for the film (actually shot in 2015) debuted this past spring, it promised, with typically huffy Warner Bros. hyperbole, “the darkest telling of the beloved masterpiece.” But it seems that having the jungle boy swear to skin the tiger and lay his hide out on Council Rock is just too dark for modern tastes in, well, darkness. Even those who’ve never read or seen a version of The Jungle Book will find Mowgli’s take on the story excessively familiar. The immortal jungle is being intruded upon by human development. Mowgli, a toddler found alone in the forest after an attack by the man-eating Shere Khan (Benedict Cumberbatch), is adopted by a wolf pack and brought up under the tutelage and tough love of the black panther Bagheera (Christian Bale) and the bear Baloo (Serkis with a cockney accent), both battle-scarred veterans of the law of the jungle. To these and other well-known characters—the slithering python Kaa (Cate Blanchett), the proud wolf chief Akela (Peter Mullan)—Mowgli adds Bhoot (Louis Ashbourne Serkis, the director’s son), a puppyish albino runt who, like Mowgli, doesn’t fit in with the rest of the wolf cubs. As in Favreau’s The Jungle Book, all of the animals in Mowgli are digital creations—though, unlike Favreau, Serkis doesn’t strive for realism. Far from it. With his lame paw and over-sized head, Shere Khan looks like an old, ratty toy, while Akela bears a striking resemblance to Huckleberry Hound. Other characters have been given squashed, anthropomorphic facial features; this makes the mo-cap performance more humanlike, though it has the unintended effect of making the denizens of the jungle look like escapees from The Island Of Dr. Moreau. Favreau’s film offered seamless, photorealistic spectacle; Mowgli answers the question of what a panther would look like if it had Christian Bale’s face. 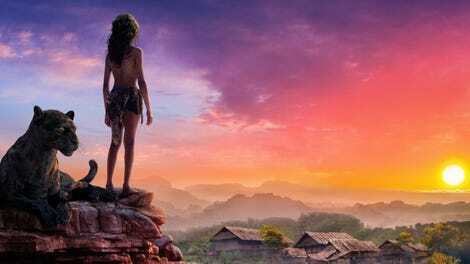 The performances are actually the strong point of Serkis’ film, beginning with Rohan Chand’s boy hero, easily the best live-action version of Mowgli. But the characters, human and animal alike, are ground down by a plot that moves through the jungle like invasive machinery. Mowgli must go through trials; he must learn that he is special; he must attend many fractious, co-op-board-like council meetings in which the animals debate whether he really belongs with them; he must risk ideological corruption at the hands of secondary antagonists like the hyena Tabaqui (Tom Hollander) and the British big-game hunter Lockwood (Matthew Rhys); he must fulfill his destiny and bring peace to the wilderness. Callie Kloves’ script has its moments—notes of sadness, cryptic turns of phrase that recall Kipling’s prose. (“Sometimes I dream I’m a tiger,” says Tabaqui, “but I always wake up a hyena.”) Yet, too often, Serkis’ direction comes across like a pale imitation of the films he’s appeared in. He borrows Matt Reeves’ approach of framing special-effects characters like live-action actors from Dawn Of The Planet Apes and War For The Planet Of The Apes (and even enlists Michael Seresin, the cinematographer of both of those films), but shows about as much flair for staging dialogue as the average rookie drama director; the result is a lot of close-ups of animals talking, framed from the neck up. The apocalyptic prologue, narrated by Blanchett, brings to mind a discount Fellowship Of The Ring, while the requisite detour to the ruined city of the Bandar Log—the mischievous monkey people—smacks of that film’s Mines Of Moria, minus Peter Jackson’s sense of scale, pacing, and wonder. The film is something like a digital tiger itself: an approximation, not exactly the same as the real thing. With the cut to credits, it ceases to exist.